Charles Rice Goff III - "Bacterial Culture"
Fasten your seatbelts kiddies because we're taking a ride with the Willie Wonka of the sound-art world. 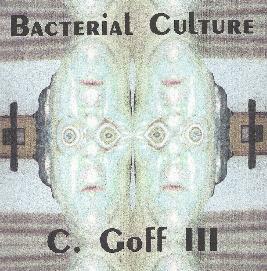 Charles Rice Goff III's Bacterial Culture consists of 18 short tracks that are loaded with his trademark surgical studio cut ‘n paste and an almost urgent sense of fun. We've got all kinds of free-improv acoustic stylings with a mish-mash of voice samples layered in, from TV and radio samples and who knows what else... avant-garde orchestrations, one that seems to nod in Phillips Glass' direction but with George W. Bush babbling along with it (by no means the only political statement on the album)... proggy electronic orchestrated freakouts with lysergic voicings... an assortment of imaginative studio splice ‘n dice, which anyone who has heard much of Charles' constructions will know he excels at... sound art insanity which makes for the ultimate avant-garde psychedelic experience... and on we go. The Goff palette includes music, sounds and voice samples, and the magic lies in the mix. Who needs hallucinogenics when you can simply crank this stuff into your cranium? If Dr. Demento hosted an avant-garde show Charles would be in heavy rotation. Visit the Smell The Stench web site at: http://home.earthlink.net/~thedweller/id3.html.